Your relationship with your significant other is, by definition, an essential part of your life. This reflects in your goals as well. 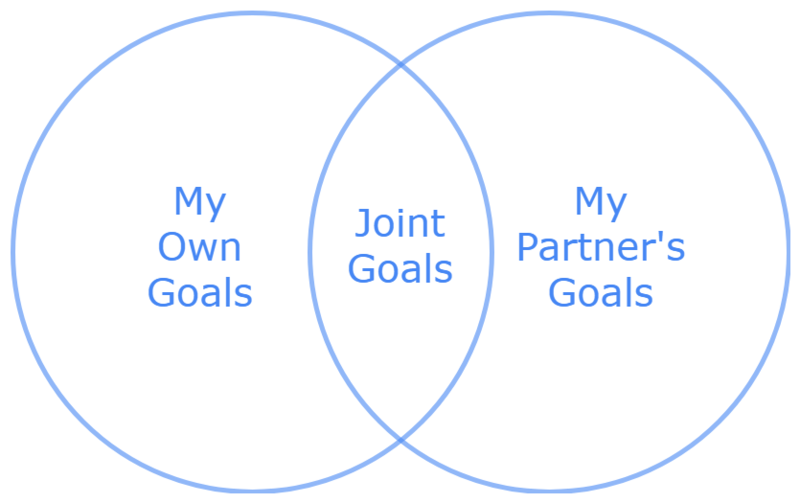 Ideally, you have a lot of joint goals together. However, having own personal goals is important as well. 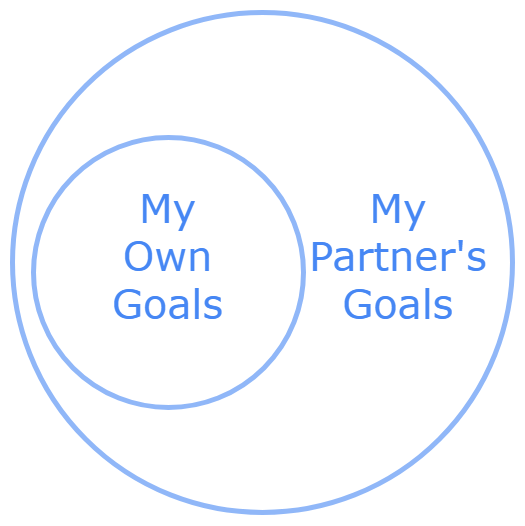 If there is no, or only little overlap between your and your partner’s goals, this might be a problem. Also, if you only live for your partner’s goals (or vice versa), this is far from being ideal. In this case you live your life for the goals of another person. Sure, you love this other person but completely omitting your own dreams and goals generally is not a good idea. Let us start with your own goals. Sharing your goals selectively with people that want you to succeed might help you to accomplish your goals. 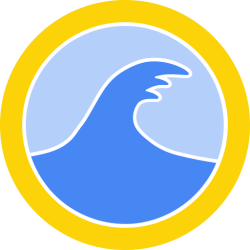 Your supporters hold you accountable, help you when you get stuck, keep reminding you, provide additional motivation and you can approach them when you need a helping hand. Who can better fulfill this role than your beloved partner? At the same time, you can be the supporter of your partner too. You can form a mini mastermind group where you help each other with your goals. For example, you can schedule regular review sessions. Here come some typical examples for own goals that are not necessarily the goals of your partner as well. Of course, you can also talk about your joint goals in your review sessions. Your biggest goals should be supported by your partner as well. Your biggest goals should be indeed your joint couple goals. 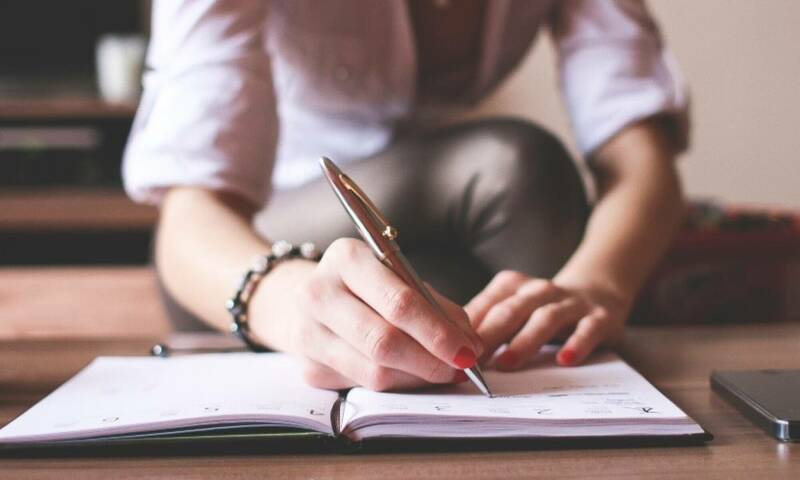 If your goal is to travel the world and to become an adventurer and your spouse’s goal is to buy a house and to stay at home this might work but there is also quite some potential for conflict. At some point in your life you made the decision to live your life together with your romantic partner. If you are married you committed even more, for better for worse. You made the commitment to stay together, so support each other and to grow old together. Maybe your life partner is or will become the other parent of your children. Your couple goals might develop over time. Some people say you get more and more similar to each other when you live together for a long time. In any case, it helps when you share some core values right from the beginning. Take some time to talk about your goals. You never know, maybe some of your personal goals becomes joint goals over time. When talking with your partner, do not forget to listen. At the end every healthy relationship involves some compromises as well. Typical examples for couple goals include the following topics. Besides personal goals and couple goals there are also the goals involving your relationship itself. Your relationship with your romantic partner is an important goal category, same as other categories like health, career or personal growth. If you have a life partner or if you are married, you probably would like to maintain and to grow your relationship. There are plenty of books and articles talking about how to have good relationships. You can find a great starting point at ThePowerMoves.com – Best Relationship Ever: Start Here. Of course, there are some basic requirements like love, respect, gratitude and trust. However, a positive outlook or joint life goals are important as well. 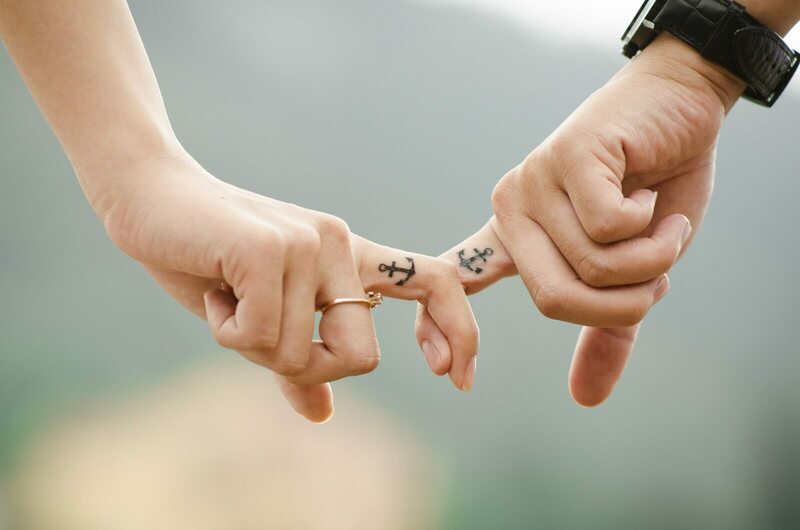 What we mean by goals for your relationship are the goals directly related and intended to strengthen your relationship with your romantic partner. Of course, your joint couple goals and helping each other with your personal goals are already of big help for your romantic relationship. Your relationship shall be a save haven for your goals. At the same time, your goals shall be aligned with and strengthen your relationship. Think of every day as your own little Valentine’s Day. Because, if you love each other, this is indeed the case. And, if you show your love in words, deeds and surprises, your love relationship will become a great foundation for your goals and for a fulfilled life as well. If you are looking for a small present for your loved one, whether it is for Valentine’s Day or not, you might want to give the gift of happiness. 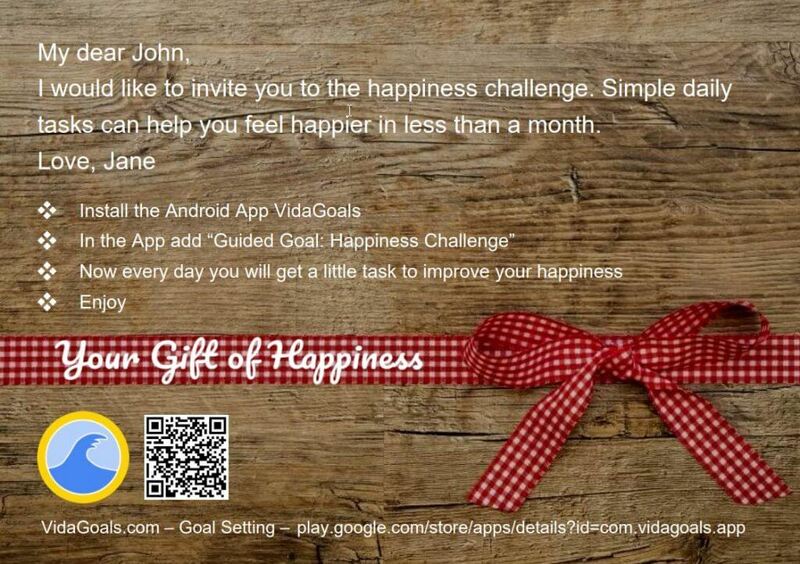 There is a Happiness Challenge available in the free VidaGoals app. This challenge consists of small daily tasks with the objective to make your partner happier. Your partner can do some tasks alone and you can do other tasks together. It is fun. Give it a try. And, to make it look a bit more like a present we have prepared this personalized gift card for you.